Almost a year ago, as a beginner to baking, I was searching for few western recipes using ragi. I came to know about few recipes and bookmarked them. I have prepared and posted one recipe(Ragi cookies) here already from Sanjeetha's site. 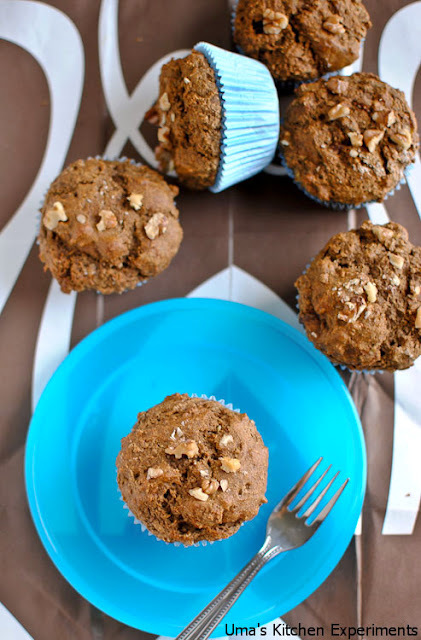 The other one is from Ayeesha's site which are nothing but these muffins. 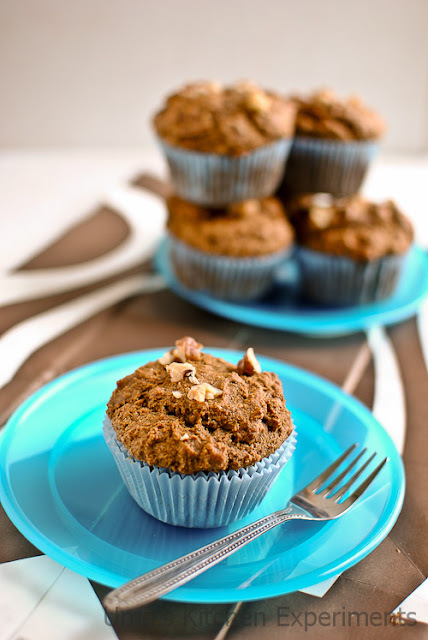 Banana and walnut from this muffins add extra taste and you won't feel that ragi is added to these muffins. 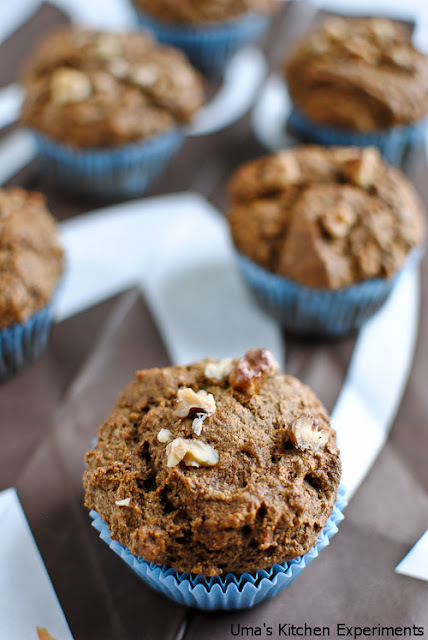 I am planning to prepare these muffins again and this time, I am planning to add more walnuts for extra crunch and add an extra tablespoon of milk for extra moist. 1) Preheat the oven to 180C(355F). Line the muffins tray with muffin liners. 2) In a wide mixing bowl, sift and mix wheat flour, ragi flour, baking powder, baking soda and nutmeg powder. Keep aside. 3) In another bowl, add all the wet ingredients. 4) Pour the wet ingredients to the dry ingredients along with brown sugar. 5) Mix just until all the ingredients are combined. Do not over mix. 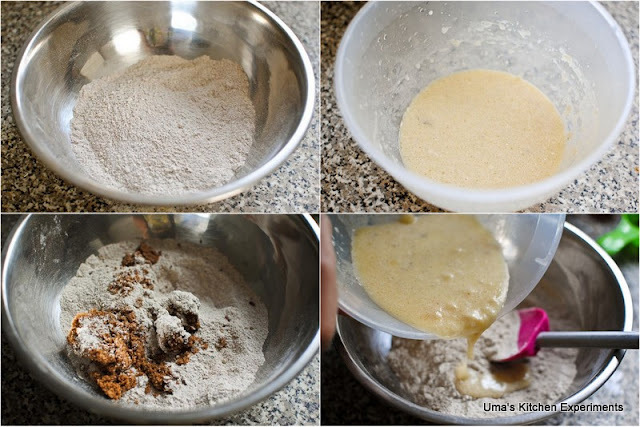 6) Spoon this mixture equally to the prepared muffins tray. 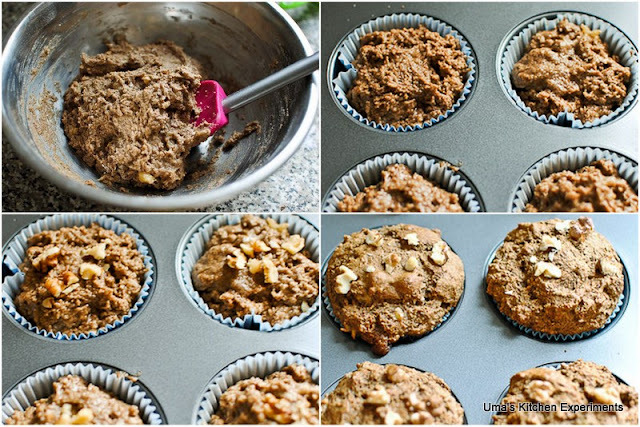 7) Sprinkle the crushed walnuts on top of each muffins. 8) Bake it in the preheated oven for 15 to 20 minutes or till the tooth pin inserted into it comes out clean. 9) Transfer the muffins to wire rack and allow it to cool for a while. 10) Serve warm with hot milk. 1) The conversion of all the ingredients is given approximately based on conversion charts available over web. 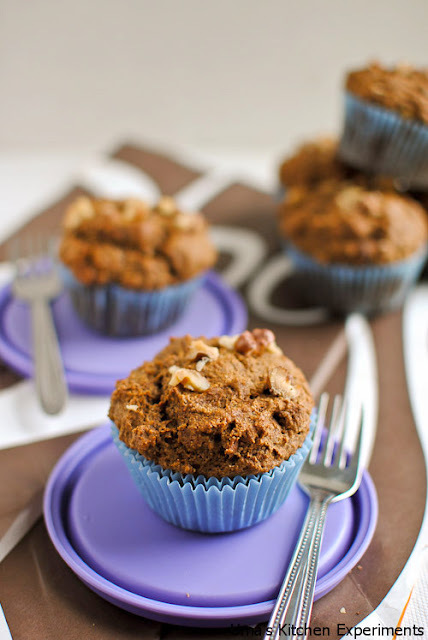 Healthy cupcakes...and lovely pics Uma..would love to try these sometime..
wow you are a baking expert uma.. i love muffins..
Love the idea of ragi instead of maida! Very healthy muffins. Bookmarking dear. just one question. was it moist? I love banana-walnut combo..sure Ragi will give a nice twist! healthy and delicious looking muffins. 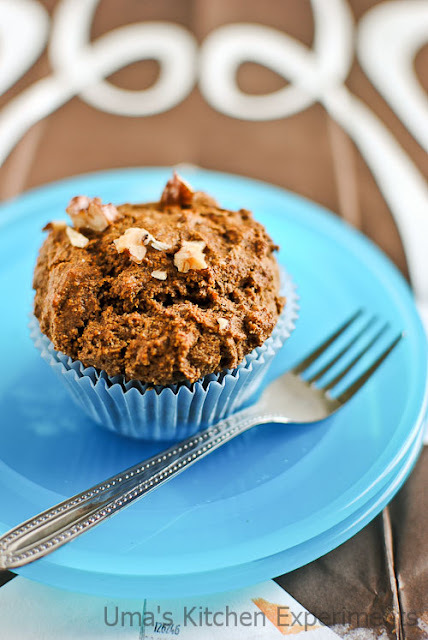 Super healthy and tasty muffins. Lovely preparation. very interesting combination recipe dear..
That looks healthy and delicious too! I made this as banana ragi bread, substituting the milk for curd and replacing the sugar with four tablespoons of honey. It turned out very well. Thanks for the recipe! Hi Sowjanya, can you try adding additional tablespoon of milk or try reducing the microwave time? Even normal cakes tend to become hard if you overcook it in microwave. Hope this helps.